Koi fish tattoos are often very intricate and are very common on those that are fond of body art. These pieces often include curves, elegant angles and bright scales which reveal the gentle nature of the koi which is considered to be good luck. Koi is the Japanese word for carp, but this fish is also a symbol that is commonly seen in mythology. If you are interested in symbolism behind tattoos, a koi can be an ideal choice. 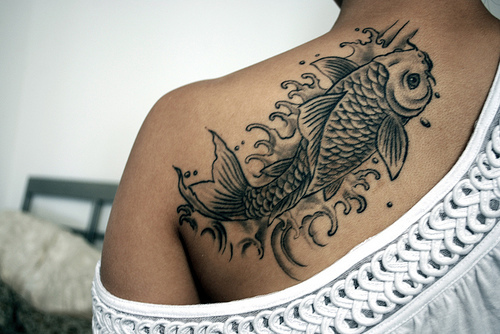 So what is the meaning behind different koi fish tattoo designs? Koi fish tattoos typically symbolize good luck and fortune because legend has it that koi can climb the falls of the Yellow River to become a dragon. Koi often symbolizes a person’s aspirations to improve themselves. A Koi tattoo is often chosen by those that want to showcase their personal strength or perseverance through difficult situations. Those that have high expectations for their life also tend to get koi tattoos. There are a variety of meanings for koi fish tattoos that are less common than those for the traditional orange-gold koi fish. There may also be different meanings for fish that are swimming in different directions. These meanings will be addressed later in the article. Red koi often represent love, which is typically expressed in a strong or masculine nature. Red is considered very energetic so this is often considered one of the strongest of contemporary koi tattoos. Black koi often represent overcoming a major change with success. This change often comes with adversity or pain, but this person overcame these challenges to get back to the place where they are now. Blue koi fish tattoo meaning is considered very masculine, but can also represent reproduction. If the blue fish is swimming up it may represent people overcoming a personal adversity. If the koi is swimming down then it may represent having already overcome a problem that this individual was facing. Dragon koi tattoos symbolize overcoming obstacles because this type of koi fish swims up the Yellow river and then is said to transform into a dragon. Overcoming adversity is represented in this tattoo by the strong river and the fish moving to fulfill its destiny and reach its goal, a common message in koi tattoos. Dragon koi tattoos also symbolize strength and will, the urge to go against the odds to meet their destiny. Dragons can represent ferocity and power, along with an aura of mystery. They may symbolize rebirth or a new beginning. Those that have been through a divorce or bereavement will use this tattoo to symbolize a new chapter in their life. Lotus flowers are commonly depicted in tattoos. These flowers grow in a muddy pond but develop into a beautiful flower which is much loved. The lotus is often paired with a koi which can take on a variety of meanings. This tattoo may represent purity, struggle or a change in life. The lotus with the koi may also represent struggle, determination or inevitable success. What Is the Whole Story Behind Koi Fish Tattoo? Why do Modern People Get Koi Fish Tattoos? Now that we all know koi fish tattoo meaning. The koi legend has become a symbol for modern people that made it through tough times. People that have had to overcome obstacles may use the koi as a symbol for the luck or bravery that got them through. These stories represent those that have fought adversity such as surviving cancer or becoming sober. They can use this fish as their personal symbol to represent their success. Those that have had a tough life but have made it through to a stable time can use the koi fish as a way to symbolize their success. These stories are all linked by the idea that these people have battled themselves, tough situations or other people to get where they are today, just like the koi fish of legend.